Recently I realized something about myself. I don’t like Superhero Comic Books. Granted, I love Batman, and am quite fond of Batman, Red Robin, Gotham City Sirens, and to an extent Power Girl (though I have yet to read beyond the first issue, I find the overall light tone…okay so there’s a mass panic and people die, but the character of Power Girl is a very fun character to read. More on this later). But after reading JLA: One Million, I realized that it really wasn’t any fun to read when I a) didn’t know all the characters that well, and b) really, really had no idea what was going on. True, JLA: One Million isn’t exactly well written, but it did turn me off to giving titles like JLA a chance. Mouse Guard on the other hand is the exact opposite of JLA: One Million. The story isn’t excessively grand, and the characters were portrayed much more effectively than in JLA: One Million. The story is similar to the Redwall series, for those of you that are familiar with them. It revolves around a society of mice, the cities that they’ve built, and the guard they’ve established to protect themselves from the dangers of the wild. The three main characters are all guardsmice that were sent to investigate the disappearance of a merchant, but come across something much larger. Guardsmice function as both soldiers and guards for travelers, pathfinders, and so on. For me they easily stand on par with other fictional organizations such as the Guard of the Citadel, and the Veni Yan. I’m a pretty big fan of warrior organizations, both in fiction and in history, so this graphic novel really spoke to me. Mouse Guard – Fall 1152 is a quick read, but David Petersen (who entirely deserves his Eisner Award if you ask me) manages to fit in an incredibly gripping story, and strong characterization, while at the same time establishing the mythos of a world that carries a delicious Celtic flavor with it. 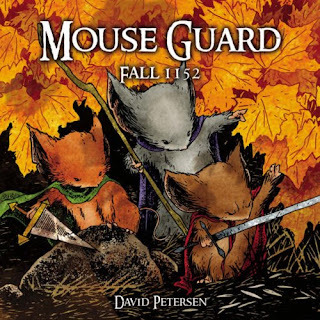 The world of Mouse Guard may be small, but thanks to Petersen we have a rich history portrayed in very limited space. I would even go so far as to describe Mouse Guard as poetry rather than prose. I say this because, like poetry, Mouse Guard manages to say the most by telling the least. Words and pictures are sparingly used, and beautifully crafted, to convey a wealth of information as effectively as possible. And after trying to read John Byrne for the past few days, you have no idea how much I appreciate this. For me the purpose of the graphic medium is to tell as much of the story as possible through the pictures. Excessive narration only disturbs the flow, as witnessed in far too many older comic books. Petersen understands this fully, and allows his pictures and characters’ actions to speak for themselves. The art is gorgeous, with backgrounds that at times allude to the Bayeux tapestry, and at other times have a texture reminiscent of parchment. The overall sketch-like art style used on the mouse characters reminds me of the classic Disney films directed by Wolfgang Reitherman. This is the first volume, with the second one coming out soon, and several more volumes announced. It’s a fairly young series, but definitely worth supporting. I wholeheartedly suggest that you pick up a copy.